last weekend was relaxing and beautiful down here in georgia, and i spent as much time of that perfect spring saturday outside as i could. phillip came over to the condo where i was happily chatting with my neighbors chris and suzy and their sweet little pup shorty. the trees in our courtyard were providing the perfect amount of shade, and the slight breeze kept us cool. we cracked open some bud lights and caught up on the latest. it’s wild how much you don’t see your neighbors when the colder months are here. i felt like i hadn’t visited with those two in months! as the early evening crept in, i could feel my stomach rumbling. we weren’t in the mood to cook, so phillip and i were trying to figure out where we should go for dinner. we knew we wanted to dine alfresco since it was such a gorgeous night, and with that must-have, chris and suzy were quick to recommend smokebelly bbq just down the street off east andrews. i’d gotten their flyers and coupons in the mail after their grand opening but hadn’t yet given it a visit. suzy was armed with several suggestions, and since i never turn down good bbq, we knew just where we’d be going. her fingers were crossed that we would like it just as much as she did; considering she’d been back several times after first going with chris, it sounded like a pretty good bet. smokebelly has been around for a little while now, and whenever i’ve accidentally driven by the place, there always seem to be folks out on their patio. we southern folks love our bbq, so opening this kind of restaurant in atlanta is quite the endeavor. 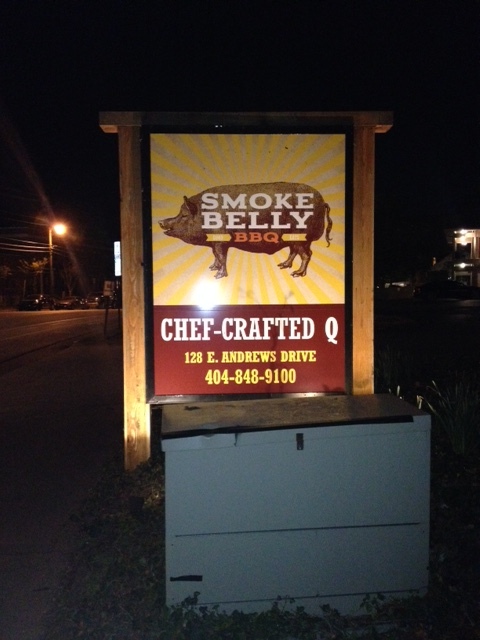 here at smokebelly they serve up “chef-crafted ‘cue with soul-warming fixin’s” in a very welcoming atmosphere. our waitress danielle was just a doll all night, and we were even waited on by a few other friendly members of the staff. smiling faces and a good reputation are easy ways to a great meal, so things were definitely starting off on the right foot when we were seated at our hightop out on the deck. 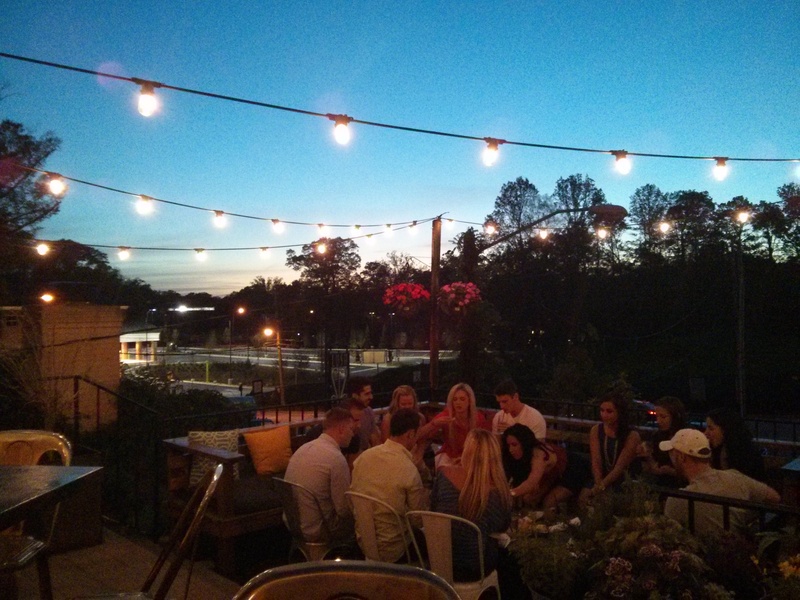 the patio here at smokebelly is quite nice, if i do say so myself. they’ve got tables and cabanas and booths, oh my! there are large shadow-casting umbrellas everywhere to keep you cool. there are even fans you can sit by so that your hair will look all wind-blown and model-esque. 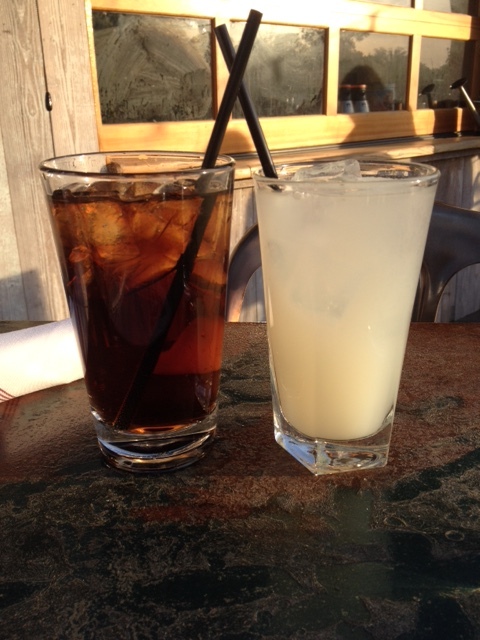 it was, in all seriousness, the perfect spring evening for some outdoor dining. even though it wasn’t the hottest of april nights, i still wanted something besides water to wet my whistle. i decided the parkside fizz sounded like a good choice, and after taking a taste, phillip and i agreed it was a pretty solid drink. it’s got citrus vodka, almond syrup, lemon juice, and mint. there was just the right amount of mint, but we could have used a touch more of lemon. not too much, though, because we don’t want it to be too tart or sour. the citrus vodka was very good as was the almond. anything that’s a little sweet and sparkly is right up my alley! phillip kept things classic with a coca-cola. he declared it had an “upscale fountain taste.” mm, very nice! personally i’m not much of a selfie-taker, but phillip and i wanted to have a little fun. i mean, it’s kind of hard not to when you’re with someone you like, you’re getting ready to eat great food, and you’re enjoying some beautiful views. i asked phillip to grab a couple pictures of me since my hair was all kinds of straight and looking pretty decent. plus, i was wearing a new shirt and my favorite sunglasses, so it was the perfect opportunity. next, we bring to you the many faces of phillip. his first silly one is in reaction when we turned off the fan and i lost all my runway model hair. the second one, i’ll have to let him explain. i think the third one is my favorite. i threw a few filters on that bad boy and love the vintage look and feel of it. i’m so glad he doesn’t mind my quirky sense of humor. if you can’t laugh with someone, then what’s the point, right? chris and suzy had recommended many of the dishes they’d already tried in their visits to smokebelly, and one they mentioned that we just had to try were the blistered peppadew peppers. this dish has goat cheese, smoked almonds, black pepper honey, and house-made crackers to accompany the peppers. the presentation was a bit different than we expected but still smelled amazing. i thought the peppers were going to be stuffed, but as we would soon find out, you can still make yourself a delectable bite with each ingredient. …to take a very graceful bite. the pepper was lightly grilled to bring out its natural flavor, a good call by the chefs. the bite as a whole is sweet and juicy and then slightly spicy. the smooth and creamy goat cheese was a perfect topping, but i’ll admit we wanted there to be more of it. you can never have too much cheese! the honey isn’t overpowering, a perfect sweet hint to complement the cheese and pepper. if you want a bite with a little more kick, leave off the honey and cheese. it’ll be a different but equally as delicious flavor. personally, my favorite part of this appetizer might just have been the home-made crackers. they are crunchy and toasty and, in a single word, excellent. they have the perfect amount of kitchen pepper seasoning, and if smokebelly were ever to bag these things up and sell them in the store, i can guarantee i’d have some in my pantry at all times so that i could enjoy them every day of the week with all of my favorite dips. okay, let me get back to the real reason i’m writing this post: the meats. phillip and i were hungry, but since we weren’t hangry, we decided that the delta double would be a good way to start. if we wanted more, the kitchen would be open. anyway, with the delta double you get to choose two meats and two sides, a good kind of dish to share. 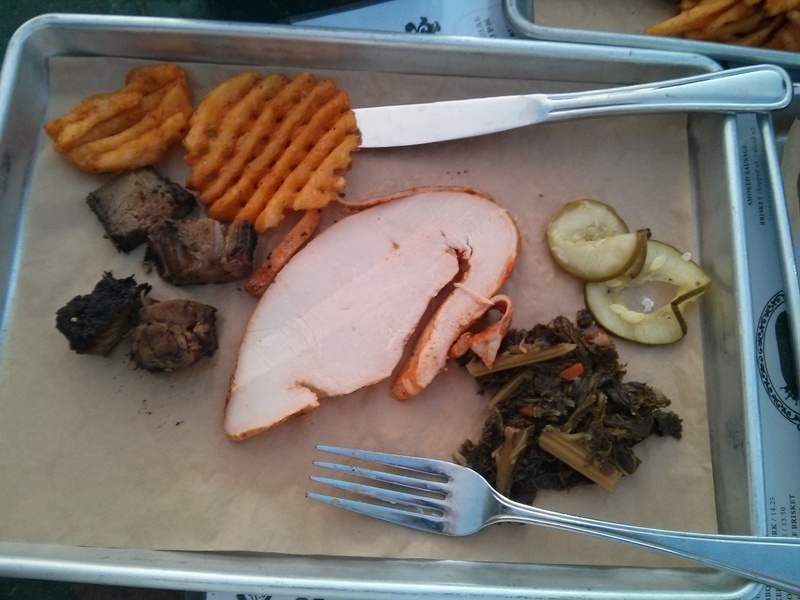 we went with the chopped brisket, smoked turkey, waffle fries, and smoky braised kale. our duo came out very soon after ordering, so we quickly cleared the table to make space. 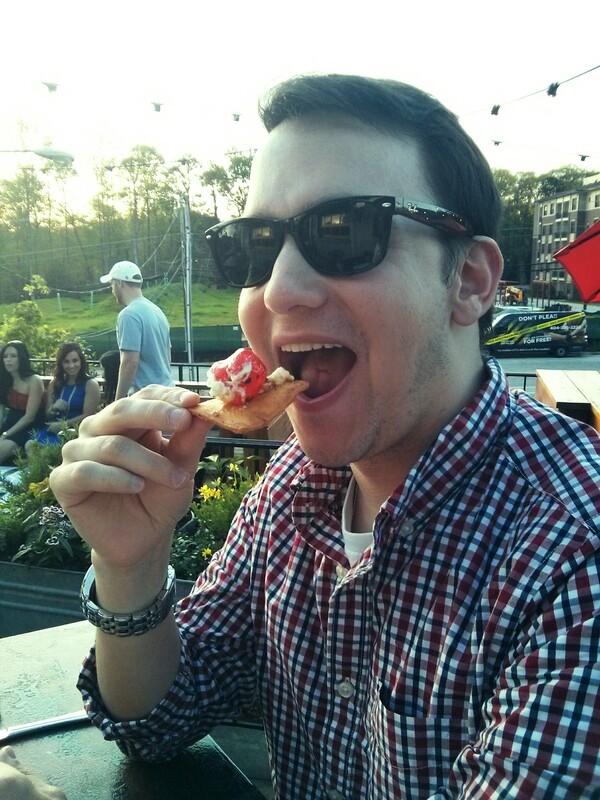 even though it may not have looked like a ton of food, i knew, even before the first bite, that it would be filling. the waitress kindly brought a second tray, so i fixed myself my own little plate. how cute! before busting into the meats and sides, i quickly consumed the pickles. i disliked pickles all through my childhood, but thankful that my tastebuds have evolved, i am always happy to eat them up when they come as a side or appetizer. the meats here at smokebelly are served smoked and sauceless. wait, sauceless? but how am i going to eat my bbq?! don’t fret, my dear! i will first assure you that you can easily eat your meats without any sauce at all. yes, you heard me correctly. no sauced bbq. the brisket and the turkey were moist and flavorful and tender all on their own, all of which are very important things when it comes to barbecued meats. the brisket had that nice charred outside and some delectably fatty parts, and the turkey was really unlike anything i’d ever had. i really only ever eat deli turkey on my sandwiches or carved turkey at thanksgiving. this smoked turkey definitely was out of sight! if you’re a sauced bbq kind of person, though, you will surely find a match with smokebelly’s sauce bar. inside they’ve got a little counter where you can go and fix yourself up a little tray full of sauces. it’s a cool idea, but my only comment about having the station inside is that there will be a lot of up and down from your table depending on what you like and don’t like. i’m sure personal sauce caddies per table wouldn’t be nearly as cost effective, but it definitely would be much more convenient. anyway! they’ve got a great assortment of sauces for you to try, seven currently “on tap” to satisfy your tastebuds. if my memory serves me correctly, the sauces in the pictures below are as follows (starting in the upper left of the tray and working clockwise): savory, sweet, spicy, carolina red, carolina gold, alabama white, and cherry cola. since i got a little bit of each, phillip and i were on a mission to figure out the best meat-sauce combo of the night. the spicy sauce is more of a flavorful spicy than heat spicy. it’s a good, traditional spicy bbq sauce that won’t steer you wrong. the savory sauce got a thumbs up from us both, while the sweet sauce and cherry cola sauce were, to put it politely, not our favorites. one of our favorite bites of the night was the turkey with the alabama white, a suggestion from one of the waiters. i was in a little bit of heaven with that combination and quickly polished off my turkey with the rest of that sauce. sorry, phillip! the brisket with the carolina gold was good but it wasn’t great. i like the idea of a mustard sauce, but i wasn’t terribly excited about that one. the brisket really paired much better with the savory sauce. the vinegary carolina red and spicy sauce were also good dips for the brisket. the brisket in general has more flexibility with the sauces, so it’s a good vessel to try a variety of flavors. for phillip, the savory sauce was his favorite, hands down. in fact, he liked it so much that he had to fetch us two more ramekins before our trays were empty! in between bites of brisket and turkey, we tried the sides. the kale is prepared just like collard greens, and if you hadn’t told me it was kale, i would have assumed it was collard greens. the kale is a bit more tender than greens usually are, and it had a nice little kick behind it. i would gladly have asked for a whole side of the kale myself, that’s how delicious it was. the waffle fries were also a good starchy side to have. with its seasoning, i was kind of reminded of the fries you get at rally’s (known by most folks as checker’s, but it will always be rally’s in my heart). apparently you can get rally’s fries in the freezer section at costco. how do i not yet have a costco membership?! we were getting through our meal when i was suddenly reminded that we were supposed to ask for the pork rinds! chris and suzy told us they weren’t anywhere on the menu but that we had to order them. i grabbed the attention of an employee and requested an order of them. they were promptly brought out to our table, and they were just the most darling pork finds you’ve ever seen. okay, wait. 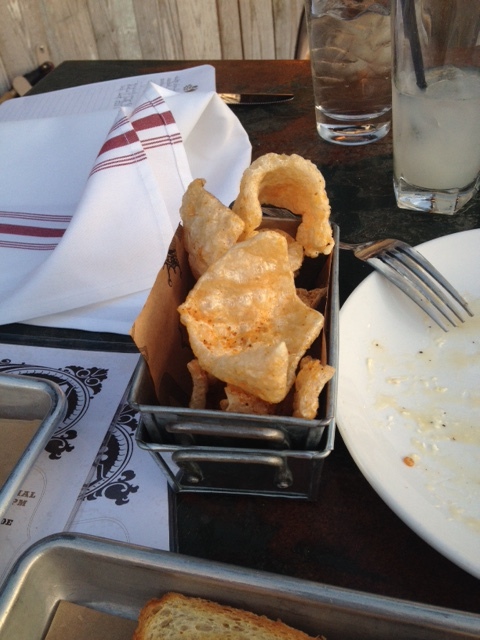 let me clarify there that i don’t regularly eat pork rinds nor do i seek them out at restaurants. we’re in the south, and when homemade pork rinds are offered, you just cannot turn them down. this dish is light and salty and crunchy and is the perfect snacking item. we highly recommend taking a pork rind for a dunk in the savory sauce. believe me, you’ll thank us later. i would recommend not ordering them in the middle of your meal; perhaps ask for them when you get your drinks? yes, that would probably make more sense. either way, though, you cannot go wrong. 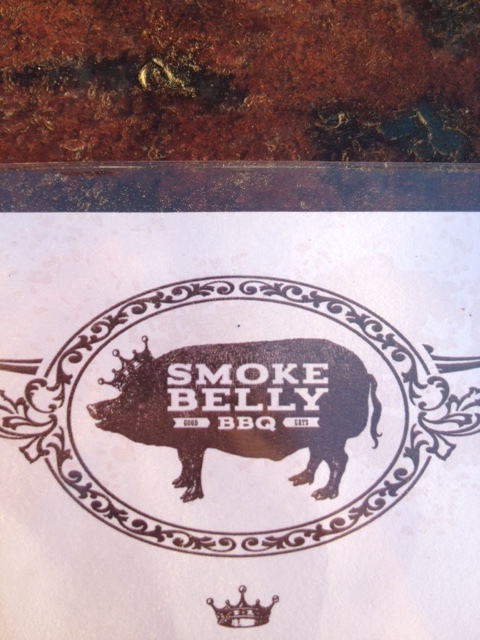 to chris and suzy’s elation, phillip and i had a great time at smokebelly bbq. in addition to the great food, the service was on point throughout the entire meal. we never felt rushed and were tended to by a variety of servers. everything came out hot, and when you’re eating bbq, that’s pretty much a requirement. even though we didn’t dine inside, we did pass through on our way to the patio. the interior is spacious and simple without being too minimalist. i would definitely applaud their decorator because you can easily dress this place up or dress it down depending on your mood. whether you arrive in flip flops or a dress, you’ll be welcomed like family. there were lots of young professionals around us, but the place had a good mix of customers from different walks. as we paid the check, we were surprised to see that we were able to do date night under 50 bucks. the appetizer and delta double was plenty of food to fill us up. here at smokebelly you definitely get a good bang for your buck, and considering it is barely a mile from my place, i’m sure we’ll find ourselves back here before too long. Of course we creeped on them! Just wait to read what happens in Austin! I just finished eating dinner, and reading this article made me hungry again. Give me the meats. Brisket and smoked turkey are my favorite. And waffle fries on top?! And a form of collards?! YES PLEASE! Next time your rear is down here, we’ll have to go! !